Georgia’s Immigration Enforcement Review Board pledged to operate more transparently as part of a court settlement with the City of Decatur and the law firm that represents it, ending a dispute that has lingered since 2017. In a consent order, the board agreed to post meeting schedules and summaries online and otherwise comply with the state’s open meetings and open records acts. The board approved the settlement at a special called meeting Jan. 8 and later posted a summary of what transpired. The settlement came three weeks after the Georgia First Amendment Foundation joined the Southern Poverty Law Center in a friend-of-the-court brief that supported the Morton, Wilson, & Downs law firm’s suit and contended the Immigration Enforcement Review Board was not following the state’s open records laws, as it claimed. The origins of the case stretch back to November 2017 when Lt. Gov. Casey Cagle, then a gubernatorial hopeful, filed a complaint with the board against Decatur. His complaint alleged the city failed to properly cooperate with federal immigration law enforcement authorities. Cagle did not publicly push the case after he lost the Republican primary runoff in July. Immigration Enforcement Review Board members in 2018. The immigration board, whose members are appointed by the governor, lieutenant governor and speaker of the state House of Representatives, reviews complaints alleging local governments are not complying with state immigration laws. 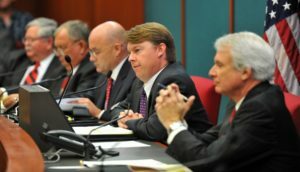 In addition to highlighting transparency violations, the dispute between Decatur and the board drew attention to board members staying beyond their term limits, which prompted Gov. Nathan Deal to name replacements.